June 28, 1960: The double doors of the now-fabled red barn swung wide, receiving the first guests of novice restaurateurs Thad Eure, Jr. and Charles Winston. What was this mysterious red building perched atop a hill so far from civilization? Unbeknownst to all, that June night many years ago, the southern gentlemen with no previous restaurant experience established both a landmark and a legend far outside of Raleigh where nobody else dared conceive success. Since June of 1960, some 21,000 nights and 14,000,000 guests later, generations continue to make the Angus Barn, affectionately nicknamed “Big Red” by Thad, Jr., a cherished part of their lives. All guests experience what Thad Eure, Jr. and Charles Winston originally envisioned: incomparable hospitality; excellent value; a meal of impeccable quality; and the rich, rustic Americana ambiance for which the Barn is now known across the globe. Now owned and operated by Van Eure, daughter of the late Thad Eure, Jr., and staffed by a loyal, hardworking team, many of whom have built their careers here, the double doors of the Barn open 363 evenings a year. Back in the day when the Barn was an outpost far from the familiar neighborhoods of Raleigh, nightly crowds who traveled the distance kindly forgave many honest mistakes including the initial absence of watering stations. Through its trials and triumphs, multitudes of loyal guests have made the Angus Barn one of the nation’s 50 highest-grossing independent restaurants, consistently ranked as one of the 100 best restaurants in the United States. Although still famous as a “Beef-eaters Haven,” the menu of the Barn has expanded to meet the dietary demands of even the most discerning, nutrition-conscious guests. In 1960, as Eure and Winston envisioned their restaurant, consensus suggested that a steak-and-potato-based menu was what the public wanted. And so began the Angus Barn’s longstanding tradition of serving the best aged western beef available. Today the Barn serves an average of 22,000 steaks per month, but the menu also features poultry, seafood and pasta. Field of dreams In 1959, Eure and Winston bought 50 acres of land on Highway 70 for $6,750. The pastoral setting originally believed by many to be misguided, halfway between Raleigh and Durham, proved critics wrong because it was convenient for business people who needed access to what would become Research Triangle Park and Raleigh-Durham International Airport. Although it is hard to fathom today, in 1960 RDU International Airport was little more than a landing strip where fewer than 20 flights arrived and departed each day. In fact, the area where the Barn exists was so desolate that Highway 70 was merely a two-lane road with phones stationed every few miles. 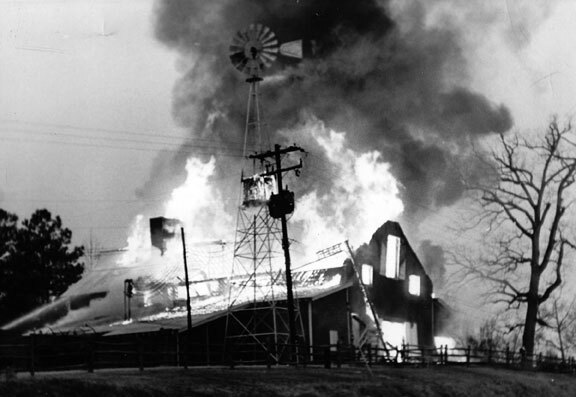 The Barn was built 12 years before bustling Crabtree Valley Mall existed. Thankfully guests who traveled the distance paid far less attention to the distance and much more to the memories they made. If you build it they will come… The original restaurant seated 275 and cost approximately $200,000 to build. Who would dare extend credit of that amount to two young dreamers whose dreams far exceeded their limited assets? Acquiring the necessary capital to pay for construction challenged the young hopefuls. Bank after bank declined Eure and Winston, politely referring to their venture as “impossible” and “a poor risk.” Borrowing from every person who had a modicum of faith in them, Eure and Winston raised money. Finally in desperation, Eure turned to his father, the late North Carolina Secretary of State Thad Eure, Sr., for the majority of the capital. In good faith, the senior Eure mortgaged his home to guarantee the loan, proclaiming, “I believe in those boys!” Construction began immediately. On the morning of February 7, 1964, Eure and Winston stood powerlessly as they watched fire reduce their dreams to smoke and ash. The restaurateurs grieved the loss of their dream that in a few short years had become one of the most beloved establishments in the Raleigh-Durham-Chapel Hill area. In the ashes only the windmill and a pair of andirons that stood in the huge lobby fireplace remained. Only recently did Van meet the gentleman who reported the fire. He recalled how frustrating it was searching for an emergency phone in the late night hours in the rural area surrounding the Barn. Build it bigger and better If triumph could come from tragedy, Eure and Winston resolved to rebuild within record time. The partners immediately began planning the new Barn, doubling the seating capacity of the old Barn. Interiors were designed by Alice Eure and the project was eventually awarded the Superlative Achievement Award by Institutions magazine for her design. Eure and Winston, who’d built their outstanding reputation defying odds, turning doubters into believers and righting wrongs, vowed to provide jobs to each Angus Barn employee during the reconstruction process. These resourceful, gung-ho restaurateurs either found jobs for employees at other area restaurants or provided construction jobs. In order to open within one year of the fire, shifts were created to rebuild around-the-clock. Teams of workers labored tirelessly to meet and beat the one-year deadline. On January 27, 1965, just eleven months after “Big Red” fell, the red double doors of the new Angus Barn swung open to welcome the public again. The new Barn, towering upon the bluff that overlooks Highway 70, fulfilled the promise Eure and Winston made to turn adversity into prosperity. In one of the finest ironies in the long history of the Barn, Eure later recalled that the very lending institutions that once deemed their venture “a poor risk” lined up to offer the visionaries capital to rebuild. Flattered by the offers, they viewed them as reassurance that their vision was still intact, inspired and auspicious. This time, Eure and Winston were here to stay! In November of 1978, after eighteen years of their legendary partnership, Eure and Winston decided to consider separate paths. The quandary: Who would sell his share of the Barn to the other? Southern gentlemen that they were, they agreed to a coin toss. The person who won the toss would decide whether to buy or to sell. Winston won. And Winston decided to sell. Winston’s achievements since leaving the Barn are as myriad as they are legendary. 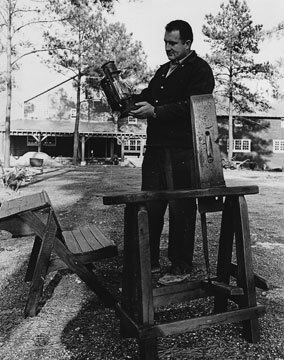 Today he is one of the most respected hoteliers and restaurateurs in the southeast without whom the Barn may never have existed. Wild Turkey Homecoming When the liquor by the drink law changed in North Carolina in 1979, allowing restaurants to serve alcoholic beverages by the drink, almost immediately Thad and Charles sacrificed their offices and converted them into the Wild Turkey Lounge. The name of the lounge came about because of Thad’s extensive wild turkey decanter collection that crowded his home. As the flock of more than 400 turkeys grew, cluttering the Eure’s living space, Alice’s patience rapidly diminished. Finally Alice declared that the flock must go! Into the new lounge they flew where they have grown by another 200. Today the collection of more than 600 decanters, proudly poised throughout the Wild Turkey Lounge is the largest private collection in existence. History has certainly blessed the Barn with many fortunate moments, but it also issued one of the cruelest. In September of 1988, Thad Eure, Jr., who earned a stellar reputation among his peers both nationally and statewide as “Mr. Hospitality,” met his greatest challenge when he was diagnosed with pancreatic cancer. True to the exceptional character of this gentle giant, he met each day of his final few months with optimism, genuine concern for others and his insistence that nothing was more important than honoring each restaurant guest as the most important person on earth. Sadly in November of 1988, the world lost a great man at the young age of 56. Innumerable honors and tributes followed Thad’s untimely passing. Having served as president of both the North Carolina Restaurant Association and the National Restaurant Association, annual awards were established in his honor. 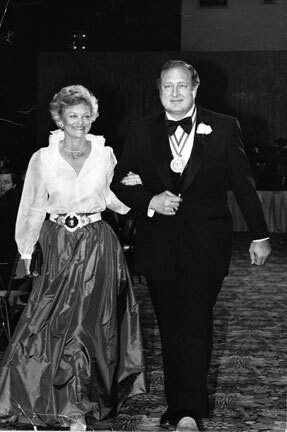 After Eure’s death, Alice and Van continued to co-own and manage his beloved “Big Red,” the centerpiece of his restaurant empire. In 1989, Wine Spectator magazine bestowed its coveted Grand Award upon the Angus Barn for the first time. It would be an honor repeated each year for the next twenty-plus years. It had been Thad, Jr.’s vision to build a wine list to rival those of California restaurants. In May of 1991, Alice and Van collaborated on one of the Barn’s boldest initiatives yet: The basement that once housed stacked boxes and cases of wine in a place called “the cages” was transformed into a spectacular, 28,000 bottle wine cellar and dining room for the ultimate dining experience. The cellar rivaled the most celebrated restaurant wine cellars throughout the United States and the world, featuring 1,200 types of wines. Once more, a heartbreaking chapter of Angus Barn history was written in the late spring of 1997 when Alice Eure faced ovarian cancer. Renowned for her awe-inspiring optimism and grace, Alice courageously endured a grueling battle for six months. On October 3, 1997 Alice also lost her battle with cancer. A lovely, gracious lady who played an integral role at her husband’s side as their restaurant empire grew, Alice left a legacy unmatched in the industry. With great courage and grace, she steered the Barn through its potentially perilous course after Thad’s death. 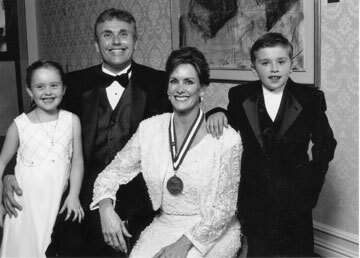 Van continued to expand and build her parents’ dream in 2008 as she and husband Steve Thanhauser opened The Pavilion at the Angus Barn. A spectacular, lakeside oasis, The Pavilion was created for special events including weddings, receptions, corporate events and banquets. The Pavilion seats 400 comfortably in rustic, wooded splendor. The Pavilion is testament to the most significant Eure family trait: optimistic stubbornness. As the Barn completed the first decade of the new century, not only did Van and Steve build The Pavilion, their dream thrives.